The internal surface of the wall is called back and the material used on the back is called backing. The outer or exposed face of the wall is called face and the material used on the face is called facing. The interior portion of wall between the face and back is called hearting and filling. 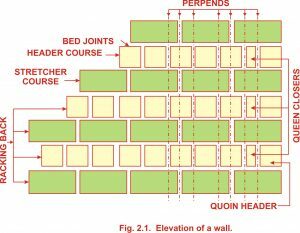 These are imaginary lines containing vertical joints of the masonry. These are spaces left between the blocks of stone in the masonry. These are chips or stone pieces used for backing up or filling the interstices in stone masonry. It is a horizontal projecting course of masonry, usually projecting from the face of the wall, intended to throw off rain water. It also gives architectural appearance and adds to the strength of the wall. It is the projecting ornamental course, usually moulded to add to the appearance of the wall. 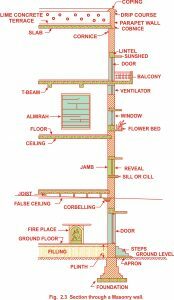 A cornice is placed in a wall, at the junction of wall and roof. To facilitate the drainage of water from the coping, a groove is cut on the underside which is called drip course. It is a low wall built round a terrace in the case of buildings with flat roofs. It is intended primarily to act as a fence wall. One horizontal layer of bricks or stones is called a course. These are vertical sides of door and window openings on the back side. These may be either square or splayed and are provided with recesses to receive door and window frames. These are exposed vertical surfaces which are left on the sides of an opening in front of the door or window frame. This is the horizontal member of stone, concrete or timber provided to support the vertical members of door or window frame. When the brick or stone block is laid in such a way that in the elevation its length add thickness is visible, it is. said to be lead as stretcher. When the brick or block of stone is laid in such a way that its breadth and thickness is visible, it is said to be laid as header. The corner stone or brick is called quoin. This brick or stone block is used at the corner of two walls meeting at light angles. 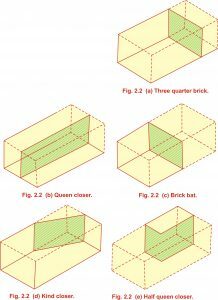 It is the name given to the half brick which is provided just near the quoin to displace perpends to provide the required lap at joints. It is a half brick cut along its length. It is a brick cut in such a way that the width of one of its ends is half that of a full brick.